Be a curious palaeontologist with the 4M Glow Dino and Fossil kit! Excavate and assemble a T-Rex skeleton, set up a model of a T-Rex skull, mould and rebuild fossil replicas of prehistoric animals. Everything you build glows in the dark! 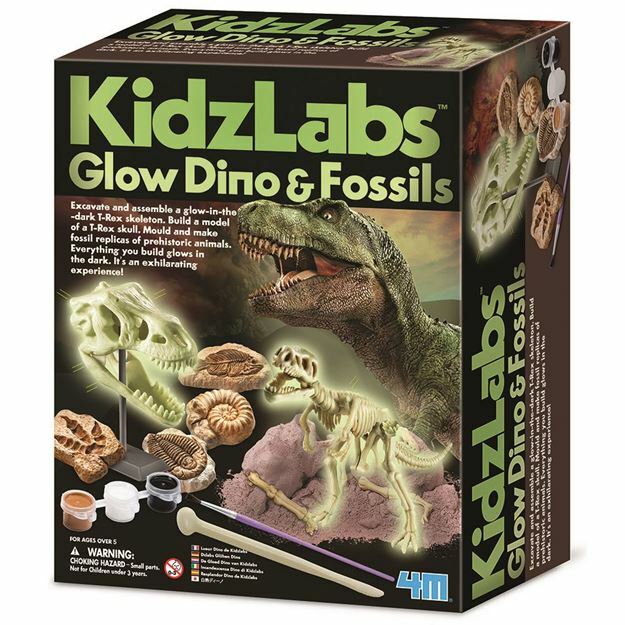 Includes: a glow T-rex skeleton, 2 packets of plaster powder, fossil moulding tray, glow dinosaur skull, paint strip, paint brush, glow paints, digging tool, self-adhesive magnets and detailed instructions. Age 8+ years. Part of the KidzLabs range. Distributed in New Zealand by Holdson.